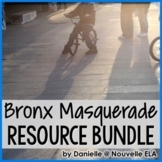 Bronx Masquerade by Nikki Grimes Print & GO Character Analysis Cards + Extras! 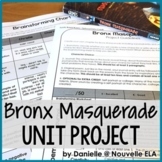 Grades 7-12—60+ Pages Product Overview/Preface: Explore the idiosyncrasies of the key characters in Nikki Grimes urban fiction novel Bronx Masquerade. Use the pre-made templates or create your own (after printing). 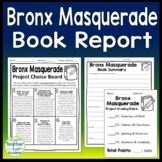 This is a breakdown of pages 34 to the end (analyzing every few pages) in the book Bronx Masquerade by Nikki Grimes. There are 3 more parts of this I posted. This is the 4th and final post. Reading questions for pages 3-16. Can also be used as daily quizzes. Please check out my listing for the remainder of the book as well! 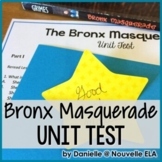 This product is a pre-reading activity for the novel Bronx Masquerade and a rubric for teacher scoring. Students are asked to create an oral presentation about the Harlem Renaissance in order to gain background knowledge on the time period and the concept of "freedom of speech/expression".